My wonderful wife got me some Oil Pastels for Christmas, so I had to jump right in and try them. I’m new to the oil type pastels so this is a little rough. I used 10" x 15" 124 LB rough watercolor paper. What I disliked about them is the same thing I liked. By that I mean they are big and balky, that makes getting fine detail at least for me impossible. On the other hand I want to loosen up and create some art that is not so tight. This scene was drawn from life using our Nativity Scene in natural light. They are glazed porcelain figures Joseph is about 10" tall. I did not do them Justice. 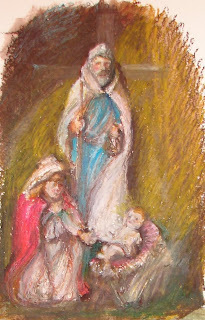 I painted this scene for our Children’s Choir presentation of "Three Wise Men and a Baby". It was painted on two 4 x 8 foot panels mounted on frames that are hinged together. We have two sets, one having panels on both sides now. 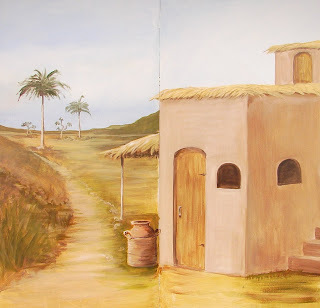 This is one of three scenes I painted last week for the program. I have painted these same panels now seven times, and I look forward to priming and painting them again for VBS in 2009. 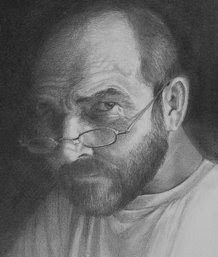 I have launched this site so I can have a record of my work. I hope it will keep me motivated as I work towards becoming a better artist. My goal is to develop my own study program using some proven techniques. I will have more about this later.